Students from St John’s Primary, Mairangi Bay. Photo courtesy of the Education Gazette. Kavanagh College, along with John McGlashan College and Columba College, all in Dunedin, were the subject of a major article in the NZ Herald, 26 February 2018, on their work in agriculture. Kavanagh College has introduced agribusiness as a subject, and the other two colleges collaborated as lead schools in setting up a centre of excellence for agricultural science and business. Agribusiness has a science and/or business focus so pupils are able to keep all options open. Our Lady of the Assumption School, Christchurch: Pupil Ngarita won three gold, one silver and two bronze medals at the Canoe Racing NZ 2018 National Kayak Sprint Championships. Catholic Cathedral College, Christchurch: Annemarie Lipp represented Canterbury at the U/19 National Track Championships. She achieved a Bronze medal in the Individual Pursuit, a Bronze medal in the Omnium, a Silver medal in the Points Race and a Gold Medal in the Team Pursuit. Roncalli College, Timaru: Jayden Walker has been selected for a Solo Role in NZ Opera’s Tosca. He has been selected as the ‘Shepherd Boy’ who sings ‘Io de’ Sospiro’, the only solo part for a child in Tosca. He will perform for audiences at the Isaac Theatre Royal in Christchurch, alongside two of NZ’s top Opera singers, Teddy Tahu Rhodes and Simon O’Neill. Sacred Heart College, Lower Hutt: Brianna Carson (Y11) finished 1st in the U20 Sprint Triathlon. St Theresa’s School, Plimmerton featured in the Education Gazette of 27 November 2017, with an update story on the schools’ work with sign language. Having won the Schools section of the Deaf Aotearoa NZSL in Action Awards the school has attracted a lot of interest, and has Van Asch has now worked with them to create a video, viewable here. St Brigid’s School, Wellington: Zach Fairless has been selected by the NZ International Softball Academy to represent NZ in the 13s in Los Angeles and Canada. St Bernard’s College, Lower Hutt: Luca van Dillen has been invited to join the full time Phoenix Academy for U15 age group. Dallas McEwan has signed a contract with NRL Club Canterbury Bankstown Bulldogs. Holy Family School, Porirua, was featured in the Education Gazette (Vol. 95 No. 22) for their flagship programme, The Family So’otaga, which aims to remove barriers to education by forging closer relationships between home and school. Link here. Francis Douglas Memorial College, New Plymouth: Albie Francis Alles (Y8) has been selected to attend a three week training camp at Fulham Football Club in England. Campion College, Gisborne: At the National U14 Surf Lifesaving Championships – Ocean Athletes, Jack Sadler won Gold in the U13 beach sprints. John Paul College, Rotorua has 61 international students, making up roughly 7% of the school roll and representing 16 countries. International students provide economic and cultural benefits for the school, and some students are raising the bar for the locals academically. St Columba’s Catholic Primary School, Hamilton: Staff member Chris May was on TV1’s ‘Good Sorts’ for his work with boys in the school, teaching them the skills to make them a good man. Link here. 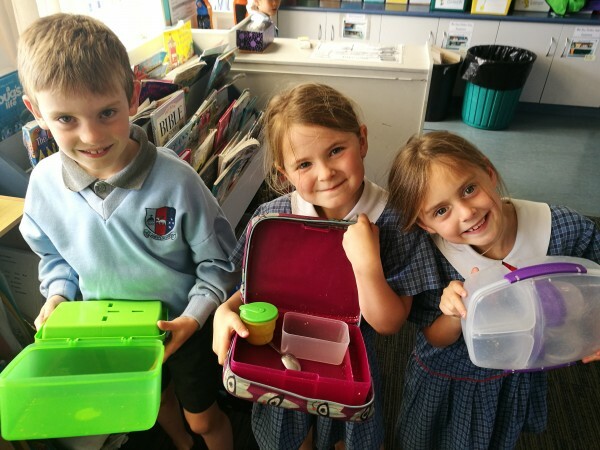 St John’s Primary School, Mairangi Bay featured in the 11 December 2017 Education Gazette, in relation to the use of Love Food Hate Waste resources. Link here. St Peter’s College, Auckland: Brodie Cox (Y12) was selected to represent NZ as part of the 2018 Trans-Tasman Archery team competing in Australia. Carmel College, Auckland: Billie Harwood (Y7) won Gold in the U11 Beach Flags competition at the National Surf Life Saving Championships. Ciara O’Neill, (Y10) won Gold for the Under 14 Beach Relay.